The first, which came quite early as I began to understand the real nature of the supranational system of government we now lived under, was that we should one day have to leave it. A second, as I came to appreciate just how enmeshed we were becoming with that system of government, was that extricating ourselves from it would be far more fiendishly complicated than most people realised. The third, as I listened and talked to politicians, was how astonishingly little they seemed really to know about how it worked. Having outsourced ever more of our lawmaking and policy to a higher power, it was as if our political class had switched off from ever really trying to understand it. Booker's response here is more or less in direct response to the commentary on his earlier pieces, where we have seen unremitting hostility from former supporters of an intensity that is as wearisome as it is tedious. Their commentary is redolent of Peter Lilley's feline remarks, where he expresses "respect" for my "original research", except where he disagrees with it. Then it is wrong. Similarly, we see an unsurpising study which confirms that political birds of a feather flock together, feeding from the sources of which they approve, sharing the material between them and excluding that with which they disagree. On this, Booker and I have been a team since 1992 – exactly 25 years – writing in great detail about the EU in the column, in daily columns in the Daily Telegraph and the Mail, and in our seminal book The Great Deception. But when we were telling the readership what they wanted to hear, they lapped it up and applauded it. Now the same team, with the same level of understanding and care, is telling them things they don't want to hear. And that's when the snide comments and the carping started. Whatever people might think, though, we tell it as we see it. And thus does Booker focus on Theresa May's White Paper, published last week. The only clear message from this, Booker says, was to confirm that we would be leaving the Single Market and the European Economic Area (EEA) – although she would be hoping to negotiate special access deals for our motor industry and financial services. Even if our EU colleagues were prepared to concede this, these are only two of the dozens of other sectors from which would be cut off. And here, says Booker, one has to wonder whether Mrs May and her advisers have any real grasp of the situation this threatens to land us in. Almost never from the legacy media or its political fellow travellers do we hear the honest truth of the situation we confront on leaving the EU – that we become what it terms a "third country". This is not something which the EU confers on us. This is something we do to ourselves, by choice. And that status brings with it all the labyrinth of technical barriers to trade behind which the EU has shut itself off from the outside world. This is not a question of the EU erecting barriers – they already exist. We choose to put ourselves outside those barriers, by the very process of pursuing Brexit. And with that in mind, Booker has been reading my analyses of the effects of walking away from a deal with the EU – not that he can identify them, as the Telegraph would remove any reference to them. But in those he found explanations of some of the "mind-bending regulatory hurdles" we would have to overcome in trying to maintain access to what is still by far our largest single overseas market. Take, for instance, says Booker, our chemicals and pharmaceutical industries, which currently account for a quarter of all our exports to the EU, worth £230 billion a year. By dropping out of the EU, these would lose all the "authorisations" which give them what Mrs May calls "frictionless" entry to its market, and the process of negotiating replacements for them would be so complex that it could take years. Equally, Mrs May and her advisers have shown little sign of recognising the horrendous difficulties that could be faced by our aviation industry and airlines, as they fly freely across Europe as part of a vast regulatory system of which we are only part because we are an EU "member state". Getting back into it would again involve incredibly tortuous negotiations. Similar consequences would face scores of other sectors, from our food exporters and our nuclear industry to our £3.5-billion-a-year horseracing industry, which can rely on its "freedom of movement" to move horses to and from countries such as Ireland and France only because we are still a "member state". People such as Lilley make a big deal of the UK starting off "in full conformity with EU product regulations etc so there can be no problem agreeing 'regulatory conformity'" and thereby completely miss the point. The racehorse scenario is a classic example where the EU's default position in respect of "third countries" is to prohibit export. It makes not that slightest whit of difference that the UK has already achieved regulatory conformity. All the other third countries that have approval have this status. What matters is that the UK must go through the hoops to gain approval. It must then seek mutual recognition of horse passports but even that will not remove the requirement for exporters to furnish each horse sent to the EU with veterinary certificates, with entry restricted to Border Inspection Posts. Interestingly, the Telegraph picture shows and Antonov AN-74 aircraft, specially kitted out for horse transport. The firm involved boasts of flying the champion colt Harzand from Ireland to the 2016 Epsom Derby, and thence back to Ireland to win the Irish Derby at the Curragh Racecourse a few weeks later. It was then flown to France to compete in the Qatar Prix de l'Arc de Triomphe. With the breakdown of the Tripartite Agreement and the UK having acquired third country status, this sort of rapid transfer would not longer be possible. The entire industry would have to adjust its trading patterns to deal with the fact that the UK will no longer be in the Single Market. The point I have been making, which Booker has picked up, is that Mrs May's Great Repeal Bill, "repatriating" EU law into our own, would have absolutely no impact. We can, for instance, enforce locally a requirement for horses to have EU-style passports, but we cannot legislate to require the EU to recognise them. All this and much more, as we constantly point out, could have been achieved infinitely more easily if Mrs May had not slammed the door on our continued membership of the EEA, which would guarantee us much the same "frictionless" access we enjoy now. Instead, she imagines that this colossal maze of technical problems can be sorted out in just two years, even though this would call on the EU to expend untold time and resources accommodating a country which wishes to leave it. This is also reflected in the tenor of the comments on the Booker column. People with not a fraction of his knowledge or understanding of the issues feel empowered to pronounce, without of course ever having to justify their own claims. This is summed up by one commenter who grandly declares: "Not important to know anything about the EU - we are leaving". Most terrifying of all, though, is the Prime Minister's threat that, if she is not given what she wants, she will simply "walk away" – reinforced by the White Paper which repeats the mantra: "no deal is better than a bad deal". 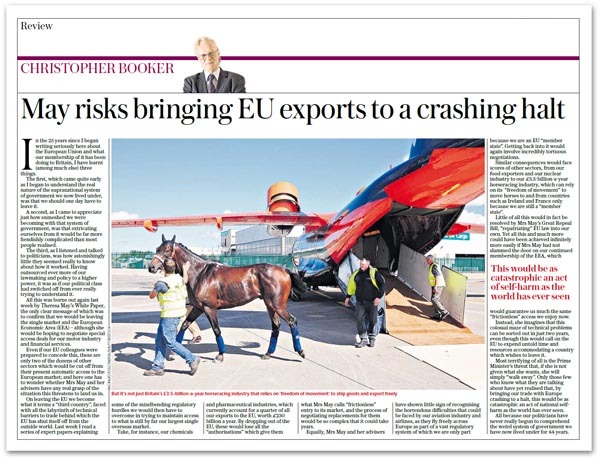 Only those few who know what they are talking about, says Booker, have yet realised that, by bringing our trade with Europe crashing to a halt, this would be as catastrophic an act of national self harm as the world has ever seen. And all because, he concludes, our politicians have never really begun to comprehend the weird system of government we have now lived under for 44 years. The tragedy here is that there is absolutely no reason why there should be a botched Brexit. Leaving was always going to be difficult, but we have never averred that it is impossible – even if some commenters would have it that this is what Booker is saying. Certainly, what I've always been saying – and Booker has supported – is that Brexit is an extremely complex process which would benefit from a measured, staged extraction, taking us out in much the same way that we went in. Yet, week on week, we see this plea for this cautious, step-by-step approach, treated with intense hostility and scorn – and ignored by press and politicians who have not a fraction of our knowledge. In a different world, with the White Paper on the table, one might have expected some questions as to whether we are getting value for money from the £100 million being spent on Brexit civil servants. After all, if that is the measure of the quality of their endeavours, we are being cruelly cheated.